AIGLE, Switzerland (BRAIN) — The International Cycling Union is warning that it will discipline its registered racers who participate in a June e-MTB enduro race organized by the International Motorcycling Federation. Bouchard-Hall will lead a "USA Cycling partner company." Bob Stapleton will step in as interim CEO. COLORADO SPRINGS, Colo. (BRAIN) — USA Cycling announced Friday that Derek Bouchard-Hall will be stepping down as president and CEO at the end of the year. UPDATED with USA BMX phasing in rule change. AIGLE, Switzerland (BRAIN) — Before preteen BMX racers head to the gate at tracks around the world next year, they may hear a new command from the starter: "Show us your feet!" LEADVILLE, Colo. (BRAIN) — Former pro cyclist Floyd Landis is using some of the proceeds from his settlement with Lance Armstrong to fund a new pro road cycling team. The team will be called Floyd's of Leadville Pro Cycling Team and will be registered in Canada. COLORADO SPRINGS, Colo. (BRAIN) — USA Cycling announced Friday that Joan Hanscom, the group's vice president of event services, will depart the organization later this year to take what USAC called "a significant new leadership role in grassroots racing development." Hanscom's new position will be announced at a future date. EMPORIA, Kan. (BRAIN) — Owner of the Dirty Kanza gravel race announced that the event has been purchased by Life Time, the fitness chain that also owns the Leadville 100 mountain bike race and the Chequamegon Fat Tire Festival. CORK, Ireland (BRAIN) — Aqua Blue Sport, a UCI Pro Continental team, will shut down at the end of this season, the team announced Monday. The team was notable because it launched with an unusual business plan, relying on a team-owned "multi-retailer online marketplace" site for part of its funding. The squad also stood out for its choice of single-chainring 3T road bikes, marking the first time a 1x group was used regularly in top level road racing. Donnelly also providing frames for the foundation's racers. BOULDER, Colo. (BRAIN) — Donnelly Cycling will be donating a portion of all proceeds from the sales of their new C//C cyclocross bikes and frames in the Amy D. blue color to the Amy D. Foundation. LOS ANGELES (BRAIN) — Bulls has made a three-year sponsorship agreement with the owners of the Sea Otter Classic. Bulls will be the official e-bike sponsor of the event through 2021. Sea Otter's e-MTB race will be named the "Bulls eMTB Race ePowered by Bosch." WATERLOO, Wis. (BRAIN) — Trek has announced the creation of a new professional women’s road team for 2019 with the intent of racing the UCI Women's World Tour. The team will include a dedicated director sportif, assistant director sportif, and support staff. 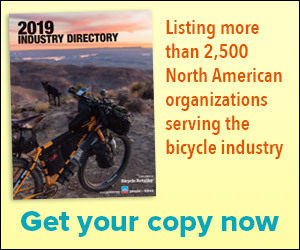 BERN, Switzerland (BRAIN) — The World Federation of the Sporting Goods Industry has formed a new e-bike committee focused on developing equipment regulations for competition. BOULDER, Colo. (BRAIN) — Pocket Outdoor Media, the owner of Triathlete magazine, announced Wednesday that the magazine will be the official race program sponsor of the Ironman North American Series for the 2018 race season.